Published on October 6, 2014 in General T&T, Media, People's Partnership and Protest. 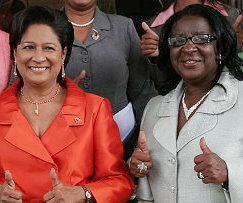 7 Comments Tags: Express, Kamla Persad-Bissessar, Keith Subero, Politics, T&T Govt, Wayne Kublalsingh. The Prime Minister, should be “so advised” that before she makes any other statements on Dr Wayne Kublalsingh’s hunger strike, she should re-examine the Dr James Armstrong independent report on the Debe to Mon Desir section of the Point Fortin Highway.